It's been a long, emotionally draining week. It's easy to feel helpless and overwhelmed with all of the tragedy that's been in the news, but here's a fun way to re-energize your soul and do some good for our fellow Texans who are struggling. On Sunday, April 28th, local vendors will team up to host a benefit concert* to raise funds for those affected by the recent tragedy in West, Texas. Presented by the AT&T Performing Arts Center, the event will feature performances by Jonathan Tyler & the Northern Lights, a brief set of solo acoustic songs by Toadies lead singer Vaden Todd Lewis, The O’s, Somebody’s Darling and Goodnight Ned. “Our hearts certainly go out to those affected by the devastation in the town of West,” said Doug Curtis, president and acting CEO of the AT&T Performing Arts Center. “The Center’s mission is about building strong communities, and we’re pleased to be able to help our neighbors to the south get West back on its feet again.” Additional event partners include Goodfriend Beer Garden & Burger House, Granada Theater, Kessler Theater, House of Blues, Homegrown Fest, Club Dada, The Door and Good Records. There will also be an on-site silent auction to raise more funds for the cause. The event will be hosted at the AT&T Performing Arts Center Annette Strauss Square from 4 to 10 p.m. Strauss Square is an outdoor, BYOB venue. 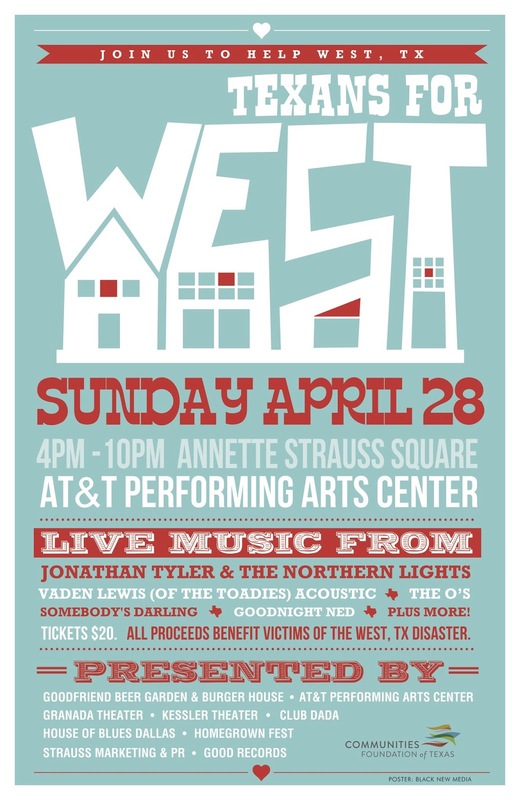 Tickets can be purchased for $20, and all proceeds will benefit West, Texas via CFT. To purchase tickets, please visit http://www.attpac.org/west. *Communities Foundation of Texas (CFT) has partnered with organizers to create the "Texans for West Fund". All proceeds for the concert will be deposited with the Foundation. Using guidance from CFT leadership, benefit creators will choose non profits whose missions are to serve areas in West Texas to provide basic needs including food, clothing, shelter and counseling services.